Do you have a Quilting Bucket List? 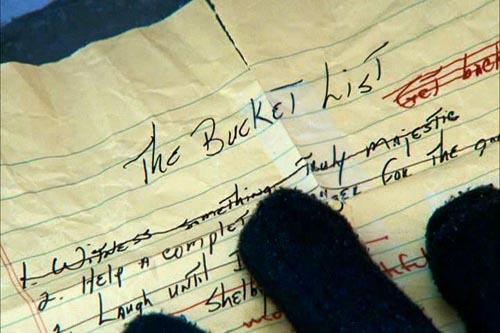 Ever since the movie came out in 2007, "bucket lists" have become quite popular and very much of our everyday vernacular. Whether you call it a bucket list, a list of things to do, goals, or anything else, all of us have things we would love to accomplish with our love of quilting. Here are a few things that I've had on my Quilting Bucket List over the years - some have been completed, some in progress, and some yet to be tackled. 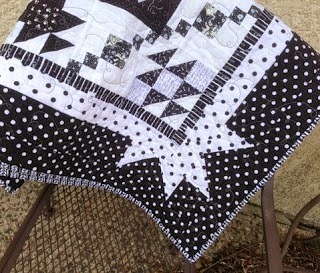 þ A Black and White Quilt. I've always wanted to make a black and white quilt. A year ago or so I started a 12 part Mystery Quilt series designed by Sherri Falls of This & That at the Quilt Cove, one of my local quilt shops. It was so much fun going through my stash picking out several black and white fabrics that I had collected over the years to make this quilt. þ Quilting Museum in Paducah. A few years ago, I had the good fortune of being able to visit the Quilt Museum in Paducah Kentucky AND go shopping at the famous Hancock's of Paducah - so much better than shopping online for fabric! è A Judy Niemeyer paper pieced quilt. I'm working on the Cabin Fever Quilt. Here are a few of the blocks that I've completed. I still have a long ways to go! è Scraps. Scraps. Scraps. Given how much fabric costs these days, I have added Scraps to the Bucket List. Rather than buying new fabric, I have cut scraps up to make zippered pouches, journal covers, and pincushions. I am also in the process of making a postage stamp quilt. Even though I have finished a few small projects with Scraps, I have left this Bucket List item as "in process" because my scrap buckets are overflowing! I've also declared 2014 as the year of scraps - i.e. find even more projects for those unwieldy scraps. v Still on the list is to experience the Sisters Outdoor Quilt Show in Sisters Oregon. The entire city is wrapped in quilts during this event for a day! What a display of color it must be!! v A manageable stash! I have fabric in totes, fabric on bookshelves, fabric downstairs, fabric upstairs, fabric on the cutting table, fabric underneath the cutting table, and who knows where else fabric has been stored around the house! I do realize that there is the belief that "The One Who Dies with the Most Fabric Wins." However, I've decided to buck that trend and try to get my stash down to something more manageable. Do you think that is possible? I hope you've enjoyed a peak into My Quilting Bucket List. It is long and ever changing as new patterns come out, as new fabrics are designed, and as my tastes and goals change. What about your Bucket List? What's on it? How long is it? What have you accomplished? I love your scrap projects! Great post!